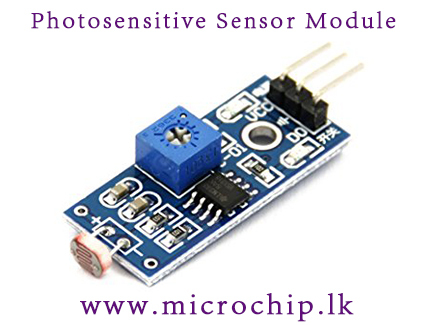 Photosensitive resistance module’s most sensitive to ambient light, commonly used to detect environment around the brightness of the light, or MCU trigger relay module, etc. Module in the environment light intensity than set threshold, output high level DO end, when the environment light intensity more than set threshold, the DO output low level. The DO output can be directly connected to microcontroller, through single chip microcomputer to detect the high and low level, thus to detect the environment light intensity change. The DO output can be directly driven our relay module, which can form a light-operated switch. No 37A, Hotel Rd, Mount Lavinia Please note that we're an online business. However, you may visit us at above address for corporate matters. Dear valued customer, due to unavoidable situation we are closed today. All orders placed today will be processed tomorrow (2rd April) as usual. We apologies for the inconvenience cased.